San Quentin Warrior Montrell Vines goes by many nicknames on the basketball court. Some people call him “Mad Defense” for his lockdown dee. Other’s call him “Jack that thing up” for his quick release three-point attempts. His coach, Rafael Cuevas, calls him the future of the team. What many people don’t know is that Vines never played basketball on the streets. Vines’ upbringing didn’t include a path to the blacktop. He grew up without a father figure. His mother raised six kids, with Vines being the oldest, in a low-income housing project in San Francisco’s Bay View Area. He dropped out of high school in the 10th grade and sold drugs. Caught up in the fast life, he said he didn’t play games. His lifestyle resulted in a conviction for attempted murder. Vines started playing basketball at Pelican Bay Prison, on the mainline, back in 2001. He used basketball as a way to cope with the stress of serving a life sentence and dealing with the passing of his brother, Alvin McEldry, in 2001, and his mother, Patricia Vines, in 2008. He started developing his game where most people just learning how to play do—on the defensive end. He out-hustles and harasses opponents. From there, his game developed a long-range shot. When he arrived at SQ in 2012, he wanted to play for the Warriors but almost missed out. Making the Warriors wasn’t supposed to include playing against Golden State players. G.S. General Manager Bob Myers, Assistant GM Kirk Lacob and Ben Draa came in occasionally on Saturdays to play against the SQ Kings over-40 basketball team. Originally, they scheduled NBA Hall of Famer Mark Jackson to come in with them and play against the Kings, until Wright got wind of the game. 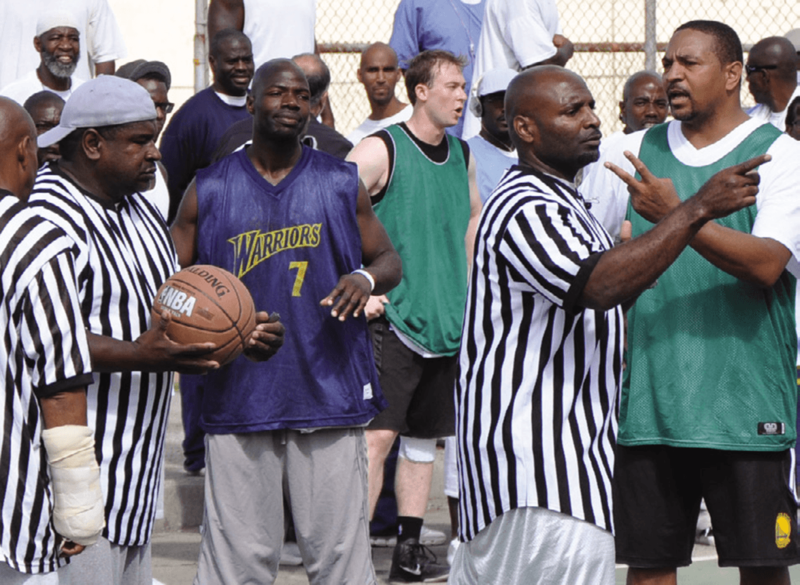 In 2012, the SQ Warriors became the prison team, representing San Quentin in the annual games against the Golden State Warriors coaches and front office staff. Vines has played every year since he made the team, even when new Warriors coach Cuevas took over in 2017. Cuevas views Vines, Jessy Blue and point guard Tyrell Price Sr. as the future of the team.